For those of us running a fall marathon – or any marathon – there are so many variables that can help make your day a successful one. 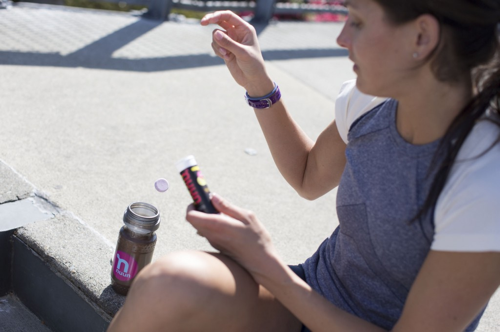 Some factors are out of our control, such as wind, heat, and humidity; but there are also things we can control that have a big impact on race day. One of the most important things, aside from solid training, that we do have control over, is proper hydration and fueling. Here are a few examples of how proper hydration and fueling can help. But how much should you eat and drink, and when? The answer to that question varies greatly from athlete to athlete depending on age, gender, weather, acclimation to weather, fitness, and diet. Because personal needs vary greatly we highly recommend testing different methods to learn what works best for you. For training sessions 2 hours or longer, here are our recommendations. • Timing is crucial! Aim to eat 2-3 hours before longer training sessions. • Choose foods low in fiber and protein and high in carbohydrates. Aim to intake 200-400 calories with electrolyte-rich fluids – this will help deliver nutrients for proper absorption. • Begin your workout in a euhydrated state (positive water balance or “well-hydrated”). Achieve this by maintaining good hydration status in the days prior to your long run, or race. Aim to intake 12-16 oz of fluids at least 1 hour beforehand (1,2). • Aim to consume 100-250 calories per hour in carbohydrate rich sources (25-60g) (1,2). Aim to drink 16-24 ounces of electrolyte-rich fluids to aid in fluid retention and to promote proper muscle function (2). Monitor signs of dehydration including fatigue, headache, cramps, and increased heart rate. • Refuel within 30 minutes of exercise with a carbohydrate and protein rich drink. Be sure to follow that up with a meal within 1-2 hours post-workout. • Hydration should be ongoing throughout the remainder of the day with electrolyte rich fluids. If you have any questions about proper hydration and fueling for marathon training comment in the field below! We’ll do our best to cover common questions in future blog installments. 1. Fink, H.H, Burgoon, L.A, Mikesky, A.E. (2009). Practical Applications in Sports Nutrition. (2nd ed., pp 220-254). Sudbury, MA: Jones and Bartlett Publishers, LLC. 2. Clark, N. (2008). Sports Nutrition Guidebook. (4 ed., pp.183-185). Champaign, IL: Human Kinetics. 3. Noakes, Tim. (2012). Waterlogged. Champaign, IL: Human Kinetics.